January 21, 2015, 10:45 a.m.
Billionaires and economists due to meet at the World Economic Forum in Davos were faced with a stark forecast from Oxfam on Monday, showing that by next year, on current trends, the richest 1% of the global population will own the majority of the world’s wealth. The report also undermined a theory popular since the 1980s – “the trickle-down theory” – that tax cuts for the wealthy will stimulate the economy, eventually raising the economic prospects of even the poorest in society. 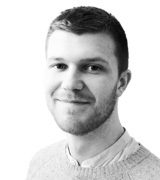 The theory, espoused most publically in the Thatcher-Reagan years, has influenced government policy ever since – noticeably in both the Blair and current government’s opposition to the 50p top rate of tax. 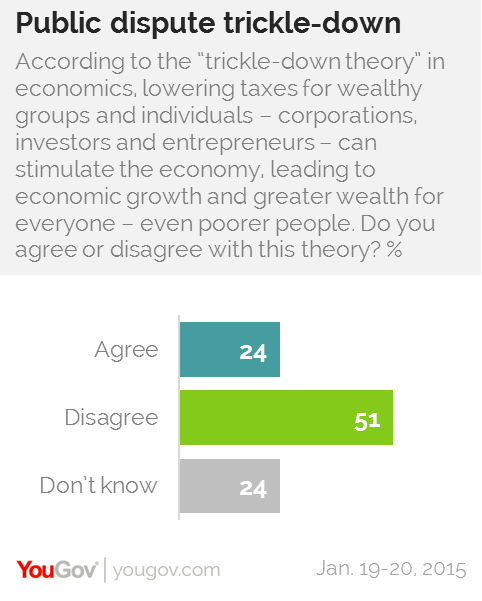 However, new YouGov research reveals that British people now reject the trickle-down theory comprehensively. 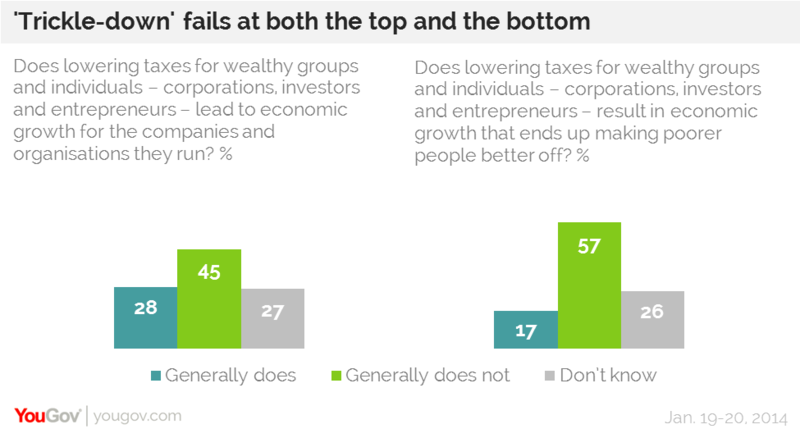 Defined as the view whereby ‘lowering taxes for wealthy groups and individuals – corporations, investors and entrepreneurs – can stimulate the economy, leading to economic growth and greater wealth for everyone, even poorer people’, 51% of British people disagree. 24% agree with the theory and as many are unsure. The theory as stated has two components that, if true, may justify lowering the tax burden on groups and individuals with capital. Taking them in turn, however, British people dispute them both. Firstly, they tend (by 45-28%) not to believe that economic growth would be stimulated even among the recipients of lower taxes. Secondly, and most importantly, the public dispute that, were any growth to be generated by lower taxes, it would end up making poorer people any better off (by a greater margin of 57-17%). Politicians may distance themselves from the term now, but Margaret Thatcher was proud of trickle-down, firmly believing in its economic credibility and seeing inequality as a vehicle for aspiration. Conservatives these days still tend to believe (by 48-28%) that lower taxes for the wealthy increase output at the top, but they are at best unsure of whether this eventually raises the prospects of the poor (33% say it does, 36% say it does not). Oxfam’s report recommends easing inequality by shifting the tax burden away from income and consumption and towards wealth. The argument is that investments can soar in value over a lifetime without ever being taxed, and can escape taxation again via inheritance, perpetuating inequality. British people also tend to say that a tax on wealth is a more effective way of decreasing inequality (by 45-31%), and we know from previous research that most people (58%) would support such a tax.